On Sunday, September 30, 2018, Our team joined others from across the Country to welcome celebration of His Excellency Dr. George Manneh Weah, President of the Republic of Liberia from the 73rd Session of the UN General Assembly in the United States of America. The MIA team was full of praises for the President ably making the case for Liberia’s continuous peace, reconciliation and development. 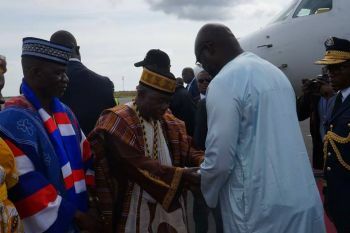 A traditional ceremony marked by presentation of kola nuts was carried out as soon as the President touched down from the airline. Thank you our President for superb representation of Liberia! The members included Deputy Minister for Urban Affairs, Honorable Paulita C.C. Wie, Deputy Minister for Research Honorable Olayee S.Collins, Assistant Minister for Administration Honorable Ruth Sawmadal, Assistant Minister for Cultural Affairs, Honorable Joseph B. Jangar, Assistant Minister Abubakar Bah, County Superintendents, chief Zanzan Karwor n traditional leaders and other staff of the Ministry of Internal Affairs.